In order to increase your performance and achieve better results in your bodybuilding effort, you can help yourself by consuming a good multivitamin supplement. It can give your body the needed vitamins and minerals as well as other beneficial nutrients to build lean, strong muscles. 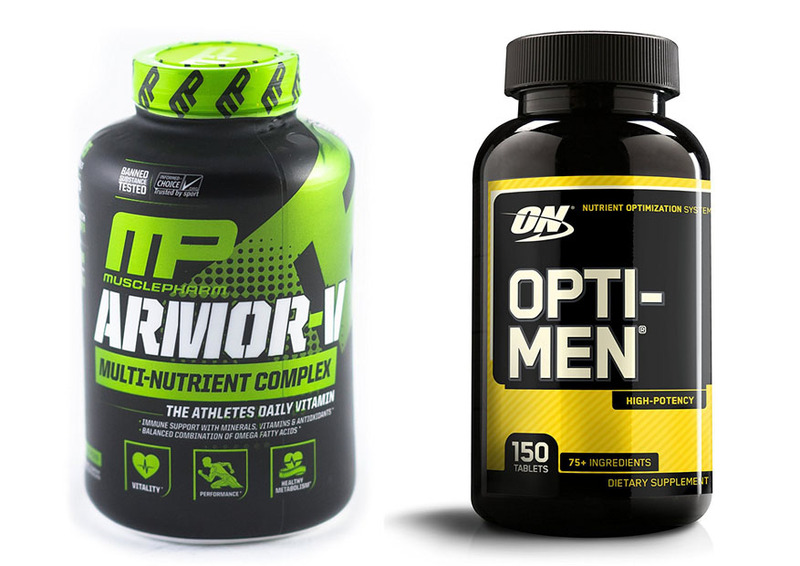 Two of the most popular men’s supplements on the market right now are Armor V and Opti Men. In order to determine which one is better between Armor V vs Opti Men, we will compare the two products below. Armor V is one of the most popular supplements on the market because of good reasons. It is one of the few products that actually use high-quality ingredients that can be digested and absorbed properly by the body. In addition, the price is reasonable and quite affordable. You can’t really go wrong with this supplement. Armor V covers the basic vitamins, such as vitamin A, vitamins Bs, vitamin K2, and more. Notably, each serving provides 6,250 IU vitamin A and 235 mg vitamin C. It also comes with zinc picolinate and magnesium citrate, which are zinc and magnesium sources with high bioavailability levels – the human body is able to extract most of the nutrients from these substances. Furthermore, each serving also includes 700 mg omega complex which contains various types of omega-3s. That’s not all. Armor V is further enriched with several proprietary blends that can provide additional benefits to the body. It has a super food blend that provides great, healthy extracts such as spinach powder and lemon bioflavonoids. There is also an enzyme blend which provides some digestion enzymes to aid in the digestion process. There are antioxidants and prebiotics, too. The recommended dose of this supplement is six capsules per day. You may want to split them with different meals instead of taking them all at once in the morning. It is more effective in nourishing and powering your body if you split the multiple capsules throughout the day. Read also : Opti Men vs Rainbow Light. When choosing between Armor V vs Opti Men, many people may think that Opti Men is a better choice due to the higher nutritional values. Of course, this supplement comes with great nutritional elements. Each serving contains 10,000 IU vitamin A, 300 mg vitamin C, and 1,500 IU vitamin D, along with magnesium, calcium, zinc, and other minerals. In addition, it is also enriched with various blends, such as the amino blend, phyto blend, and enzyme blend. The amino blend will give you multiple amino acids that are important for the bodily functions, and the phyto blend will provide healthy greens into your diet. However, Opti Men’s absorbability is not very good due to the ingredients. So, your body probably will only absorb a small percentage of the whole nutrition. Still, this supplement is pretty good for supplying the vitamins and minerals that your body needs on a daily basis. Opti Men is relatively more convenient to consume because it only requires you to take three capsules per day. You should split the capsules throughout the day to optimize the benefits. Between these two supplements, Armor V is generally more recommended. The formula has higher absorbability, so it can deliver more potent benefits for serious bodybuilding. However, if you prefer a simpler and more affordable supplement just to supply daily vitamins and minerals, Opti Men is a pretty good choice.